Hannah + Matt’s wedding day was absolutely beautiful. Warm temperatures, overcast skies, amazing friends + family supporting them throughout the day… it was exactly what I wish for all of my couples on their wedding day! Hannah + Matt were all smiles all day and I loved watching them together. The way that Matt looks at Hannah and the way Hannah smiles at Matt… it’s clear that these two love each other so much. 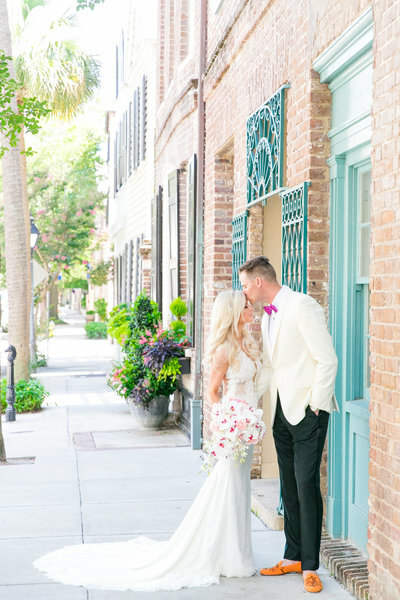 Their beautiful day started with a sweet First Look on the College of Charleston campus. Hannah + Matt wanted to take all of their pre-ceremony photos at the C of C Cistern and it ended up being the perfect spot!! The girls looked stunning in their long black dresses and the guys looked oh-so-dapper in their classic black tuxedos. I loved the timelessness of their wedding party look and those bright, colorful bouquets?! YES PLEASE! !